Calorie bomb central! Who can resist? I had a wild hair and decided that even a Pecan Pie needs a little Guinness every now and then! It just seems like a two post kinda week! Well, it is almost Thanksgiving and all! Right? I need to take advantage of the season for sure! Anyway, I was out last week for a happy hour and my friend was sipping on a Guinness beer. We were talking about how it how it has a “bitter” and “sweet” flavor. Of course, my mind started thinking about a recipe and pecan pie came to mind. I thought that this pie is so sweet that a little “bitter” would blend in nicely! So Guinness Pecan Pie was developed! After a couple of test pies, I think that this version turned out the best! De-lish! You should give it a try for your Thanksgiving table. It’s worth it! PS… I don’t normally bake, it’s not my thing generally. So feel free to make your own pie crust if you wish. I don’t wish to do that, so I bought one of those Pilsbury refrigerated pie crusts. They always work great for me. I just give it a little “roll” with the rolling pin to make the crust fit my nine inch pan! It’s actually an easy pie to make. Give it try. Plus your family and friends will think that you are cool for putting beer into a pie! LOL! Enjoy! Place pecans on a cookie sheet and brown in a 350 degree oven. Pay attention so they don't burn. I browned for 5 minutes turning a couple of times. In a small saucepan add the Guinness beer and 2 tbs of sugar. Bring to a boil and reduce the heat until you have ½ cup of the beer syrup. It took me about 10 minutes. In another, larger, saucepan, add the butter, brown sugar, corn syrup, vanilla and salt. Melt down and whisk ingredients well. Add the Guinness beer syrup and stir until combined. Place the prepared pie shell in a 9 inch pie plate. 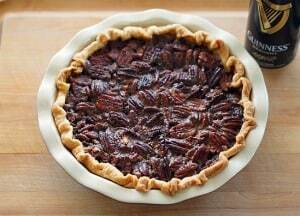 Add the browned pecans to the bottom of the pie shell. Whisk the eggs and whipping cream together in a medium size bowl. Slowly add a couple of tbs at a time of the syrup mixture, whisking constantly to avoid "scrambling" the eggs. Continue until all the syrup is incorporated. Pour the egg/syrup mixture over the pecans. Place the pie in a 350 degree oven for 45 minutes. It will still be "loose" when you remove from oven but will set up in about a half hour. Let the pie sit for a least an hour or covered overnight before serving. If your pie is browning too quickly, place a sheet of tin foil over the top for the last 10 minutes. Excellent, best pecan pie I have ever had. I plan on making it for the holidays! Great! Thanks Mike! It was nice meeting you and Stephanie! So much fun in McCook! Make it on Weds, it’s best if it sits for a day! Make sure you sign up for future posts!! I think a slice of Pecan Pie for breakfast is perfect! Thanks!!! Uh oh….now I have Billy Crystal in my head saying “Peeeeekan pieeeeeeeeeeee”. Thanks, When Harry Met Sally. This post reminds me of my grandmother because she almost always had one of these out on the counter or one of her chocolate chess pies. Haha! Chris! Now that’s what I’m thinking about!! I’m glad this reminded you of Grandma! Love that! Is there anything I can substitute for the high fructose corn syrup which I cannot have? So many holiday recipes that include it in the recipe and I get so frustrated. So hope there is a substitute? I feel your frustration Joyce- I avoid HFCS like the plague so I’m not sure what you can substitute. This is a once of year thing for me, so I only have a tiny bite! Hey there! Thanks for the ping back! Great recipe! I love your idea too!